Home » Journal » Big fish little pond or small fish big pond? Big fish little pond or small fish big pond? Defining your local place is never easy especially when you come to setting a border where everything beyond is not local…. Think about the political boundaries that already exist from parish to local councils to counties to countries. All these political boundaries have an impact on your place. To fix the impact of these areas our politicians simply invent new areas our city fish (Carlisle) will see impacts from the new ‘ponds’ created from BREXIT to devolution to the LEPs to Northern Powerhouse to Borderlands and I am sure yours will be the same. All these areas seek to redefine the pond in which our city fish swim, in some cases we (Carlisle) are bigger than one pond (parish councils) in others we are still a relatively large fish (Borderlands) and in others we start to feel like minnows (Northern Powerhouse). The question I think we all need to ask ourselves is “do we treat the smaller fish in our pond in a way that we would want the larger fish to treat us?”. At one end of the ‘pond spectrum’ is the totally equitable approach to place management where every fish gets the same share of the collective food bank. At the other end is the idea that the pond needs to feed the big fish so that it can protect the smaller fish from any large fish from neighbouring ponds. Do you feel yourself moving towards the equitable argument when your in a really large pond and towards the support the big fish argument when you’re in a small pond? I know it’s more complicated than that. Projects aimed at social change are arguably better based as close to the end user as possible so for instance, drop in centres and community spaces all need to be spread across the pond. Whilst funded capital projects concentrated on one or two projects could arguably create anchors that would attract either visitors or employers to an area. This was certainly the argument back in the day of anchor stores for high streets or anchor multinational firms for industry strategy , times are changing as I heard at a meeting recently “ one large factory does not a local economy make” and the prospect of House of Fraser leaving our High Street demonstrates the lack of control your local area has over national retail chains. 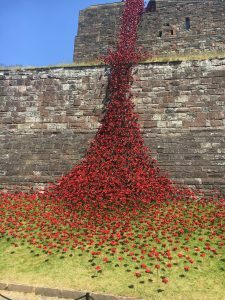 Having said that, focused action that is directly linked to your local area can have huge impact on your place, from May-July we were fortunate enough to host the ‘weeping window’ poppy display that poured over our castle keep and this has definitely increased the number of visitors to our area. The display originally set up at the Tower of London has toured the country for the last four years and Carlisle Castles connection as a recruitment base during the First World War meant we were fortunate enough to be one of the hosts for this magnificent thought provoking display. As we all negotiate our share of the pond perhaps we should reflect the reason for the poppy display. The display in Carlisle is there because of the 23,000 recruits who passed through the castle during the First World War, 7,000 paid the ultimate sacrifice and died defending their pond. When those running the pond get it wrong, it’s often the fish that pay the price. So the next time you feel like a fish in a pond , ask yourself :are you allowing enough of a share for your smaller neighbours and are you also supporting your bigger neighbours as they stand up for your pond.